Jerry Casale taught wine classes while his band took a break. 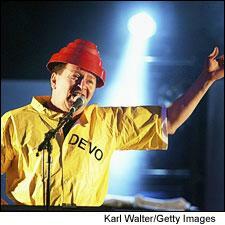 Gerald “Jerry” Casale is the co-founder and frontman of the cult new wave group Devo, perhaps best known for their hit song “Whip It.” When the Akron, Ohio, native started touring the world with his band in the 1970s, his pursuit of the perfect wine began. Casale immersed himself in tasting wine and visiting vineyards and eventually, when the band took a hiatus, he ended up teaching wine classes for three years. Today, Casale, 62, is back on the road with Devo, currently supporting the band’s ninth studio album, Something for Everybody. On a tour bus headed to Chicago for the Lollapalooza festival, Casale talked about why he loves Burgundy, what he taught his students and why he may go to Napa to make wine. Wine Spectator: How did you learn so much about wine? Jerry Casale: When we signed with Warner Bros. Records and moved to California [in the late 1970s], a world opened up to me. We hit California not only when there was an explosion in the music scene, but there was a revolution in cuisine. All the restaurateurs were now famous and had cookbooks out and were new and young and were stretching food consciousness. It stretched from Alice Waters, in San Francisco to Bruce Marder, Sam Clark and Michael McCarty. I met them all, and they were Devo fans! I got to eat and drink in their restaurants and ask a lot of questions. I started from zero and learned and learned and learned. Touring completed the picture. In Europe, I was able to visit vineyards. It was a revelation. I was so into it that I taught wine [at the Wine House in Los Angeles]. WS: How long did you teach wine classes? JC: It was in the years that Devo were in some kind of suspended animation, when there was no activity—sometime between 1992 and 1995. [The Wine House] was a serious operation: 1,000 feet of retail space, plus a restaurant and a classroom. I wanted people to strip away all the assumptions they’ve made and things they’ve learned that were wrong like sniffing corks [laughs]. Wine represented some kind of hoity-toity frightening thing to them. WS: What is your favorite wine region? JC: Burgundy. Then after that I would say Willamette Valley in Oregon; the way they grow Pinot [Noir] there comes close to Burgundy. I still do like a good Barolo or a Brunello from Italy. I’m just not a big Cabernet guy, though I appreciate it when someone opens one from a great vintage. When you get a great bottle of Burgundy, it blows away a great bottle of anything else. You can drink your way through mediocre Burgundies in the pursuit of the ultimate one, so it’s a holy grail quest. What I love about Burgundy is that the wine is so friendly when you get a good one, and it doesn’t leave you beat up. It’s so personal with the food—anything from grilled salmon to lamb chops to duck. You can even have it with some pizza. WS: How do you think music and wine complement one another? JC: To me, they’re a perfect match. Wine is half science and craft and half labor of love. It’s a great lifestyle to be a winemaker, because you’re a farmer and artist. When you’re a musician, there are mechanics to it, a history to it, and then there’s the inspiration and creativity that can’t be quantified. It’s an organic, living breathing thing, and so is wine. WS: Would you ever consider making your own wine? JC: Yes. That’s my dream. A friend of mine recently acquired a nice piece of property in Napa Valley. He spoke with winemaker Chris Cooney [at Provenance in Rutherford] and has already done some soil samples on the property. It’s really well-suited for Chardonnay and Pinot Noir, so I might be trying to grow wine up there. My dream may become reality in the next couple of years. Of course it will take a while before it will taste any good, but I still relish in the chance to jump in and get started. It gives me a good reason to stay alive. The real trick is drinking wine WHILE dancing to Devo. ARRRGGGGHHH!!! I wish I had been into wine when Jerry was teaching. That would have been a real blast! The only time I got to see him in person was around 1989-1990 at a nightclub in the City of Industry. What a fantastic amount of sound and energy! Devo's Freedom of Choice album was released at the beginning of my musical consciousness and they have always had a special place in my heart and mind. Cranking up Gates of Steel on my crappy little stereo before heading off to my first day of 7th grade, now that's notstalgia! I think I'll have to find a nice Burgundy in the cellar and open it in honor of Jerry, Mark, Bob 1, Bob 2 and Alan. Hey Jerry, wanna join me?